Good morning loveys. Today is October 6th and I just heard about it being “Inktober.” Create with ink! That’s so easy for me! So, here’s the first one of the month. You’re supposed to create one a day or five a month, or something like that. I’m going to do as many as I can in a month, instead of doing one daily. I’m not very fast. Here is my little flower when I first started. I used a black Copic Multiliner A-2 set. These are Like the Multiliner SP except they are disposable. So, they’re comparable to the black Microns. I like these better than the Microns though. In my opinion they’re a lot darker and stay on the page better with the watercolors. I didn’t plan this. I just started drawing that this is what happened. I’m not too upset about it! So after drawing lines and circles I decided to add a little color. I used an orange Micron, green Micron, pink Sharpie, and a yellow Sharpie. 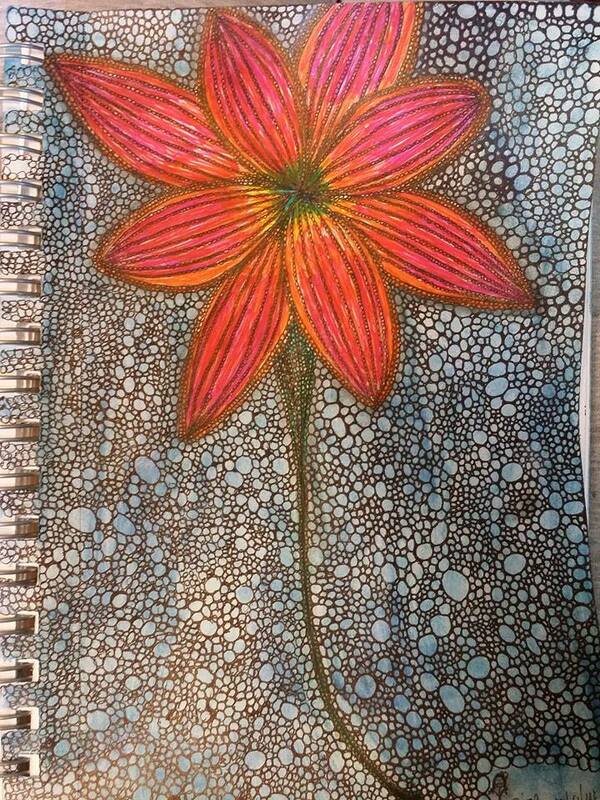 The yellow Sharpie over the pink Sharpie made it look orange but I added more orange with the Micron. Fun stuff! With a little color and some oopsies! The next step was to add color to the background, so I used my General Kimberley’s water color pencils. I love these things! 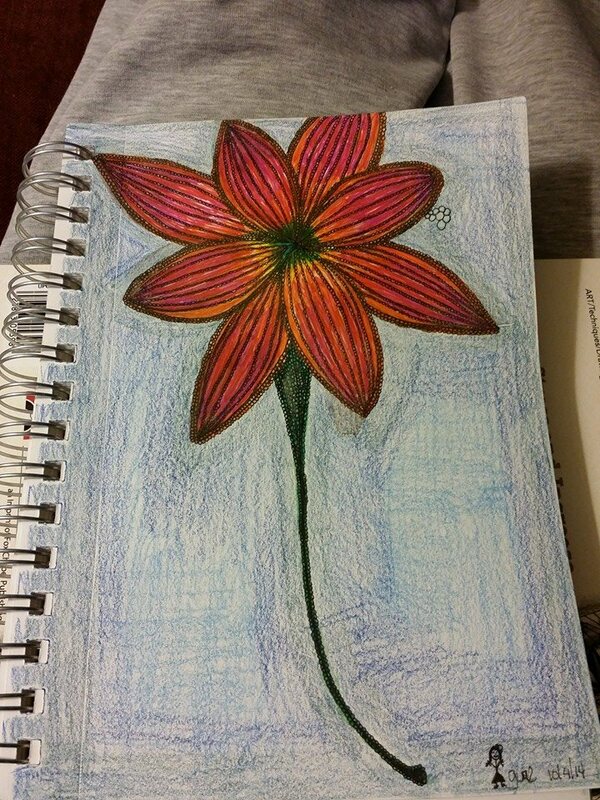 I don’t really like the look of colored pencils, and I don’t like the way they feel when you’re using them. The General’s are pretty smooth feeling though! I definitely want to get some more colors! 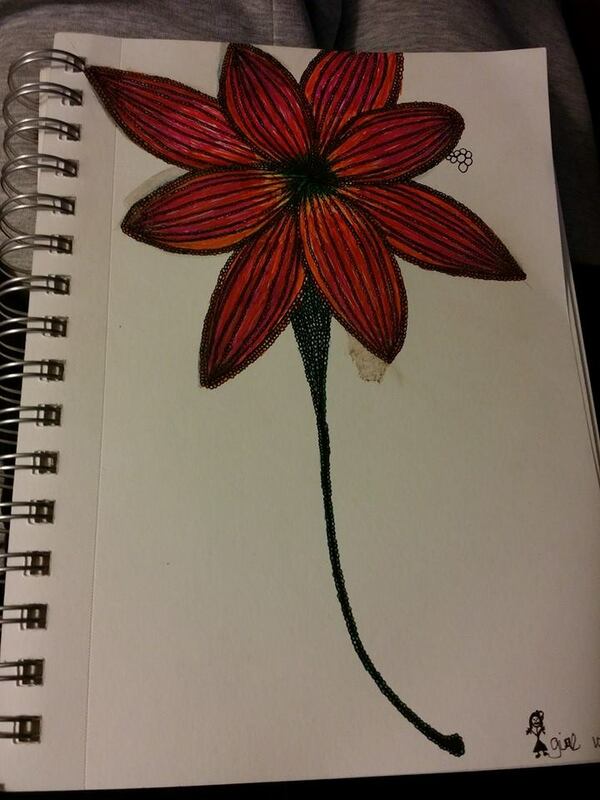 Pretty red flower with the colored pencil look background. I used three different colors of blue to get the background look and a little water on a paintbrush. This is the fun part! Here it is, mixed with water on a paintbrush. 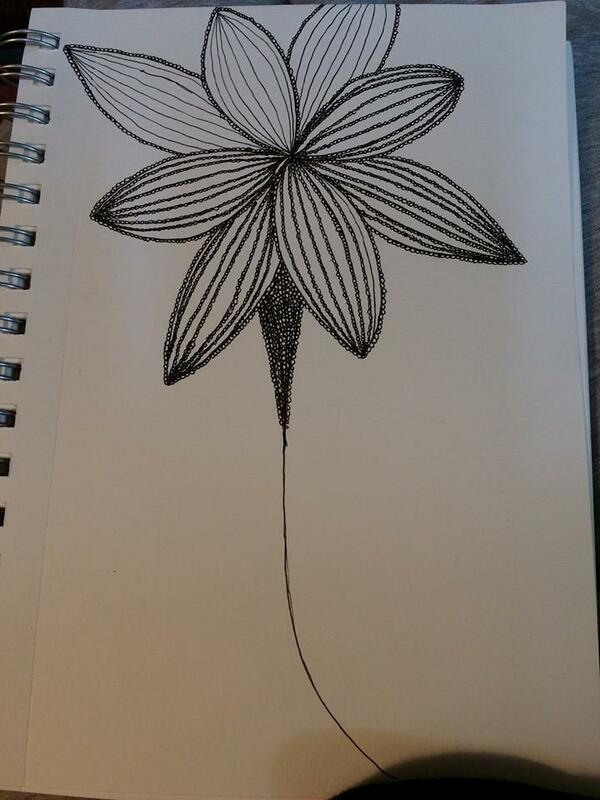 I still thought it needed more, so I started adding more circles, bigger than the ones on the plant. You can’t really see the ones on the plant unless you enlarge the picture. The last part was shading, and this is the end result! I do like this one 🙂 I think I’m only going to get better as I do each one of my “Inktober” projects. Maybe I’ll frame them and hang them in the hall. I’ve never framed anything I have drawn before. Finished product without shading and with a little enhancement. That’s it for my first “Inktober” project. Now on to make the second…..
Watch Out For That Hole!!! I have finally finished it! 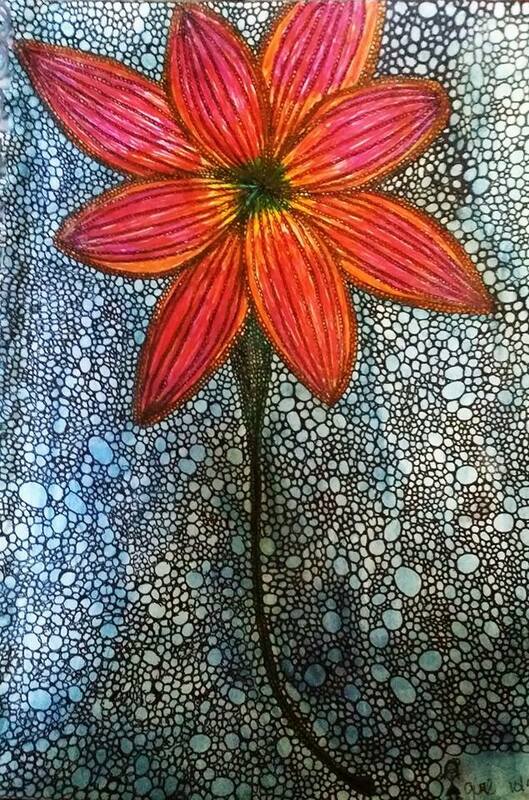 11x14in mixed media paper with copic multiliner sp pens and Sakura Pigma Micron pens. Both various sizes. I used an 8B Graphite pencil for shading. I absolutely LOVED doing this drawing. I only used three patterns, but they’re the type I like. I call them patterns unless they are official tangles. Then I’ll call them tangles. 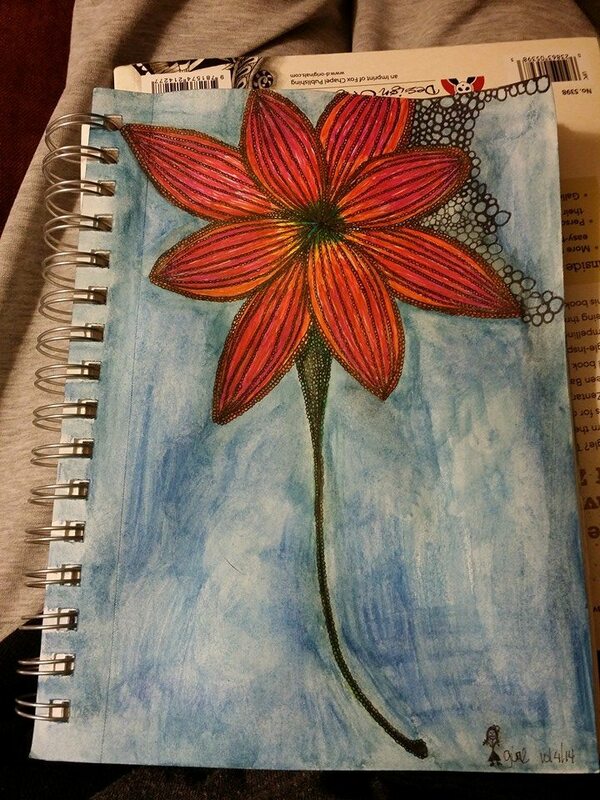 I had been stuck in a little rut for a while, so I went through all 100 Zentangle books I have. Not really 100, but if you ask my kids or boyfriend I have 99 too many ;). I love doing 3d type drawings/tangles, so I wanted to do something that really popped. I came across a pattern in Sandy strewn Bartholomew’s book, “Totally Tangled, ” called Scraper. That is what the pattern is! The wood is drawn with wood grain, and the inside of the hole is a pattern called Afterglow. It is one of my favorite ones to do. You can find it at http://TanglePatterns.com. 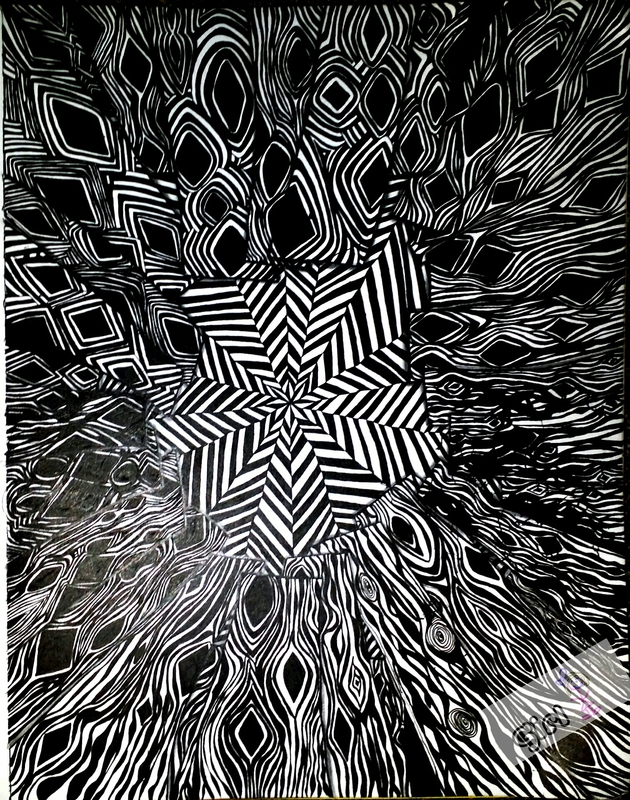 This drawing reminds me of looking through a hole in the floor and getting dizzy. I get dizzy when I look down from tall Heights. It also reminds me of Alice in Wonderland. I haven’t seen that movie in a long time, and the hole was black with things floating around, but it still had the crazy effect like this does. I showed a friend of mine the hole, and he asked me how much I wanted for it! So, I told him I would make him another one for free and if someone sees it and wants one then I’ll charge them a small fee. I did go through a few pens! So now I’m going to end this and continue on with the next! I hope you like this as much as I do!